Enter the details, location, start time and end time. If this is a meeting, add the names or email addresses of the people you want to invite. Select Scheduling assistant to see everyone’s free/busy times (Exchange users). To make this a recurring meeting, select the Repeat box, and choose how often. 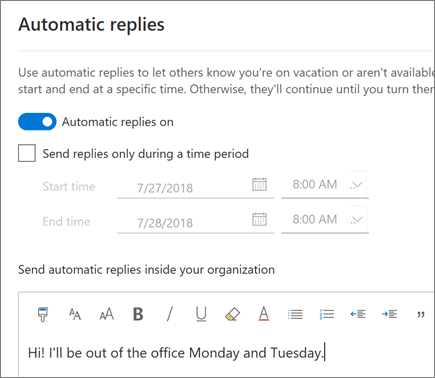 Select Settings > View all Outlook settings > Mail > Automatic replies. Select Turn on automatic replies. 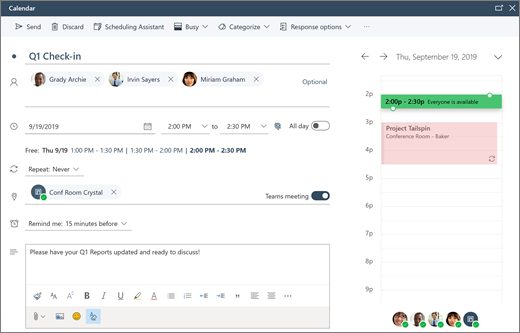 If you have specific times you want the automatic replies to run, select Send replies only during a time period and enter the Start time and End time.